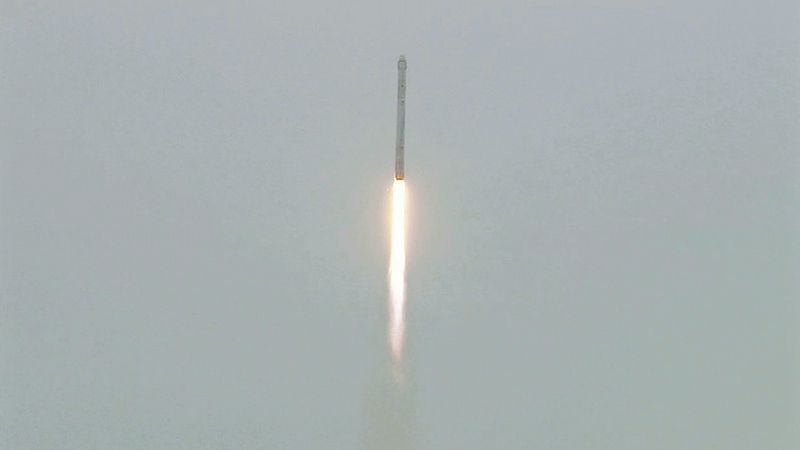 Read our launch feature about today’s liftoff here. “Looks like everything’s good on Dragon,” SpaceX founder and CEO Elon Musk said during a news conference following the successful launch of the SpaceX-3 cargo mission to the International Space Station. “I’m feeling pretty excited, this is a happy day,” Musk said. NASA is also pleased with the launch, said William Gerstenmaier, associate administrator for the Human Exploration and Operations Mission Directorate. “They did a lot of good work,” Gerstenmaier said, noting that NASA’s payload team and SpaceX worked inside tight schedules to get everything ready for flight despite significant weather concerns. Musk also reported early signs of success in SpaceX’s test to have the first stage of the Falcon 9 reignite its engines and slow the stage to a soft landing on the ocean’s surface a few minutes after liftoff. All data is not in yet, he said, but the slowdown seemed to go well. He does not expect to be able to pick the first stage out of the water, however, because the ocean waves were substantial having been roiled up by days of rough weather. 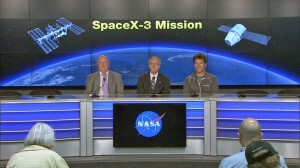 He said the flight encourages him to continue its pursuit of recovering a first stage intact. “I think we have a decent chance of bringing a stage back this year, which would be wonderful,” Musk said. 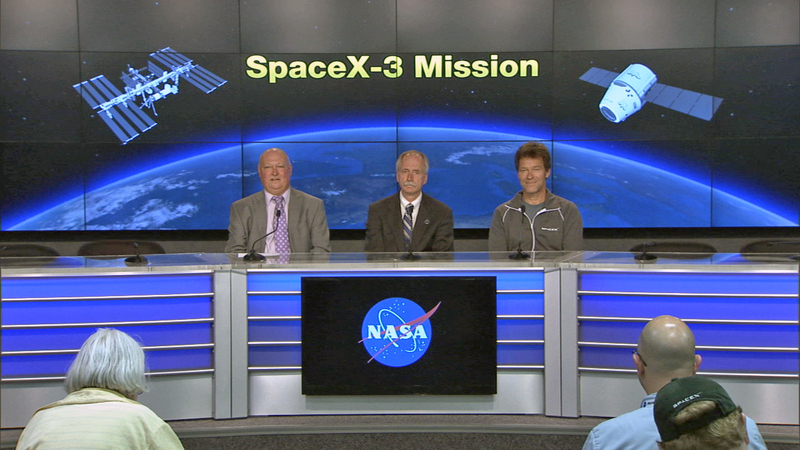 The post-launch press conference will begin at about 5 p.m. Watch on NASA TV. 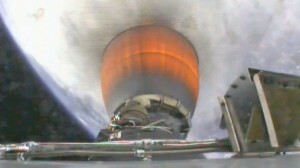 Watch as the Dragon spacecraft loaded with about 5,000 pounds of experiments, equipment and cargo, separates from the second stage of the Falcon 9 rocket to go into orbit on its own. Five small CubeSats have been ejected from their carriers on the second stage to perform their missions. The satellites, also called nanosatellites, are as small as 10 inches by 10 inches and are generally built to execute a variety of research goals. You can read more about the CubeSats launched today here and and about NASA’s CubeSat programs here. This series shows the Falcon 9 first stage climbing into orbit, upper left, before separating and letting the single engine second stage take over the work, upper right. Finally, we see the aft compartment of the Dragon as separates from the second stage and into orbit on its own, lower left. 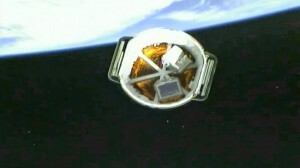 Dragon’s twin solar arrays deployed on schedule less than 15 minutes after launch. They will allow the spacecraft to recharge its batteries on its way to the International Space Station. The cargo-laden Dragon capsule is on its own now in Earth orbit and headed to the International Space Station following a brilliant afternoon liftoff from Florida. The second stage separated from the spacecraft as expected and Dragon is to soon unfurl its two solar panels to begin recharging its batteries. The second stage engine has shut down. 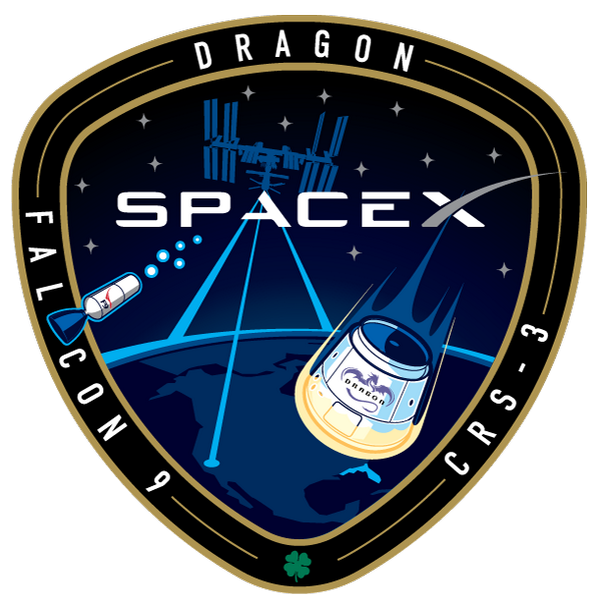 Dragon will separate in about 30 seconds on its course to the space station.